There were a large number of panel discussions to attend in the Green Zone at COP22, ranging in subject matter from implementation of sustainable practices in the fashion industry, to the implications of climate change on basic human rights. Based on the sessions attended and the topics discussed among faculty and student in the UConn@COP22 group, it seemed that one of the most pressing issues was the younger generation’s role in combatting climate change and how we as students can become involved at the local, national, and international levels. One of the first questions we heard asked at the conference, and that we asked ourselves in our daily discussions, was how can we spread awareness about climate change to people in the U.S.? Outreach is desperately needed, especially with President-elect Donald Trump, a self-proclaimed climate denier. We rebounded a number of different ideas through our group, but were not able to reach any compelling revelations. Should we try to get every student who would listen to become an advocate for the issue? Or could we get more done with fewer students who were more knowledgeable? Should we use emotive rhetoric to garner support among older populations, especially those who voted for Trump, or should we focus on better educating their children on the subject matter? It seemed as though we were stuck in a loop. Then, on Wednesday evening, we attended a higher education networking event with students from Cadi Ayyad University in Marrakech, along with students from a number of schools across the United States. The same question was posed by a UConn faculty member: how can we get the younger generation excited about this issue, and to that measure, involved? Ultimately, it seemed the conclusion drawn by both the students and faculty was that we must take action together. A Moroccan student argued that it is one thing to say you want to stop climate change, but another to actually do something about it, given most students’ pre-occupation with the daily academic workload of assignments, projects and maintaining good grades. Coming from the higher education networking event meeting, I was inspired by the similarity of our views and the power of climate change as a unifying issue among students from diverse backgrounds and nationalities. I’m convinced that the surest way for us to combat this issue is to make use of these international connections. Students at UConn and other American universities need to reach out to international students, peer-to-peer, through contacts made during study abroad programs, at future COPs, or otherwise. Mobilizing Millennials and Generation Zs, especially college students, would create a formidable international force for influencing governments and educating youth in ways that give us the best chance at combatting climate change, across all regions of the world. 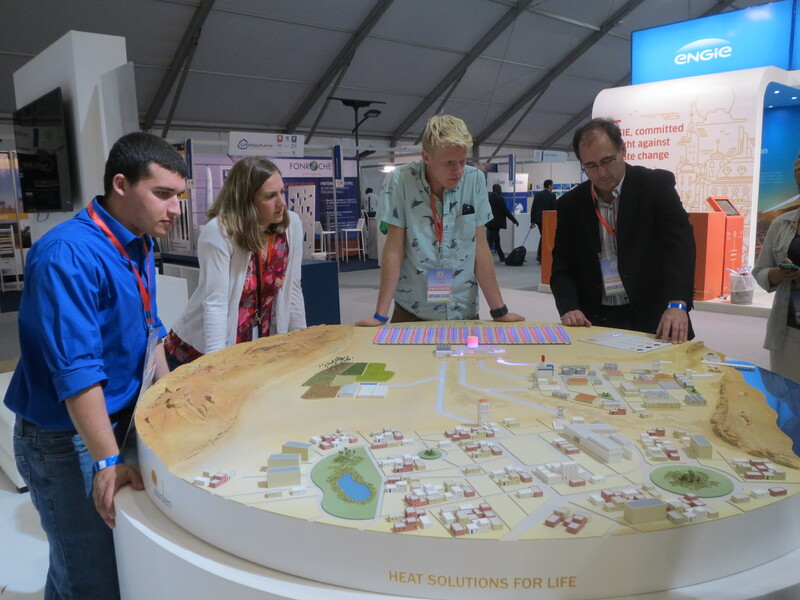 From the moment we first stepped foot in COP22’s Green Zone, an urgent question presented itself to us: What can universities do to strengthen the fight against climate change? The first panel we attended as a group Monday evening was The Relevance of Green University Networks in Promoting a Sustainable Future, a discussion led by a group of higher education leaders from around the world. One of their primary messages was that universities have a responsibility to exist as leaders in the area of sustainability and climate change mitigation. By building and supporting green campuses, universities embed a sustainability mindset in their students. Sustainable campuses allow for multiple angles of education, drawing a link between the classroom, initiative, and innovation. As stated in the panel, they “create platforms to turn knowledge into action.” This discussion was so relevant to UConn’s goals of providing its community members with a sustainable living and learning environment. I was encouraged to hear that UConn had already taken on one of the panel’s primary recommendations for optimizing sustainability: managing and monitoring both quantitative and qualitative sustainability metrics. UConn has discovered, developed, and implemented a great number of sustainability initiatives through participation in annual surveys such as the Sierra Club’s Cool Schools ranking. While at Cadi Ayyad University for our co-hosted event, Colleges United for Climate Action, a student even congratulated us for our number 2 ranking in the international GreenMetric sustainability survey. I was not fully aware until this moment that UConn’s achievements are being recognized throughout the world, confirming the higher education panel’s message that we have a responsibility as a university to act as a leader for our own community, for fellow colleges and universities, and for the world. The optimism I gained from this conference greatly outweighs my initial skepticism about the daunting nature of the global fight against climate change. The change in my overall outlook stems not from the success of this year’s formal proceedings at the COP, but rather from what I observed about the promising leadership and camaraderie amongst the millennial generation worldwide. My enthusiasm is rooted in my own COP22 experiences and interactions, which have reassured me about the connectivity of educated youth on a global scale. On Monday evening, while waiting for the bus from the Green Zone back to our hotel, our group had the pleasure of meeting a college-educated, twenty-something Reuters reporter from Cairo, Egypt. Naturally, we discussed international concerns about the recent U.S. election of Donald Trump, a known climate change skeptic. The reporter did not laugh at us but instead empathized with us. 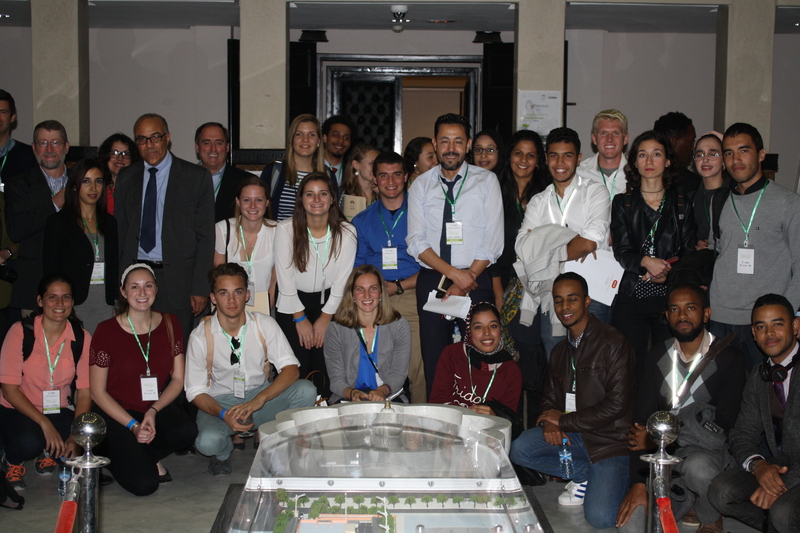 Later in the week, we had the honor of meeting with faculty, students, and graduates from Moroccan and other American colleges at a COP22 higher education networking event held at the University of Cadi Ayyad. Every individual I engaged in conversation with was intelligent, action-oriented, and determined to be a voice of change. I was especially struck by the similarity of concerns, ideas and aspirations of the many Moroccan students we met. Some would say that the competitive nature of globalization, such as international trade agreements, have led to a more divided and selfish world. However, in the case of international youth, I dare to disagree. My experiences at COP22 and the people I have met in Marrakech have given me hope for the future. I know that it will be a long process, but we can do anything when we stand together. We are united on the need for climate action. We are empathetic to the plight of those who have been or will be displaced by the effects of climate change, such as flooding and drought. We are strong in preparing for a more resilient world, and protecting those, often in developing nations, who are most at risk from climate change. We are determined to succeed. We are one. I want to believe that everyone has the opportunity to participate in environmentally friendly practices, that every community knows enough about climate change to understand the urgency of the situation. And that sustainability is affordable for all. The reality is morose. Liberals, academics and the upper class are communities privileged and enabled by the understanding of climate change, and all afforded access to sustainable measures meant to keep our world going. COP22 in itself felt accessible to few. During a session on funding sustainable practices in Africa, one man went on an unforgettably impassioned monologue about how COP22 would not have been frequented by so many African voices had it not been taking place in Africa. The Innovation Zone was found to be populated by incredible inventions and visions that would undoubtedly change lives – so long as you came from a lineage of royalty. Certainly, the world becomes more aware by the day about the impacts of climate change. But we keep educating those who are already educated. This is a problem. Continuously, there is a failure to frame the subject in a way that is understandable to the average person. Climate change is incomprehensible. Sustainability is inaccessible. Change is unaffordable. So before we expect them to understand and join the revolution, we ourselves need to fix the way we enable. It is a privilege to be able to understand climate change. It is time we make it a right. The mostly Moroccan and North African students at the higher education networking event, co-sponsored by UConn and the Universite Cadi Ayyad, were extremely excited to host us at their college. 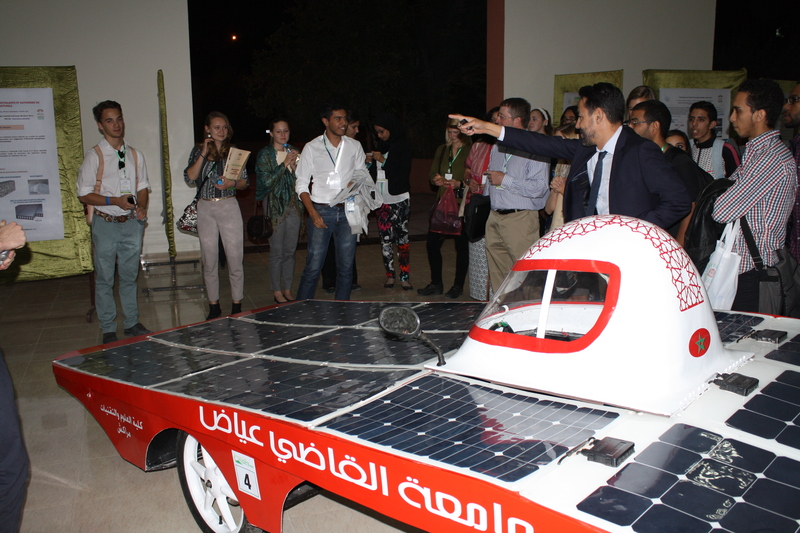 Afterwards, they showed us an exhibition displaying their sustainability-focused research projects. 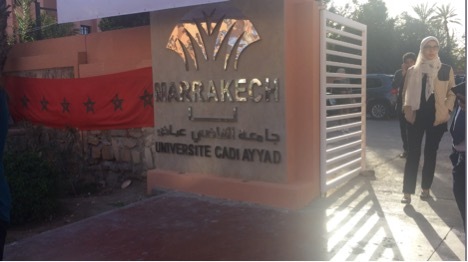 The 20 or so students from this top University in Morocco were studying a variety of majors, from biology to environmental science and linguistics. One of the undergraduate students, Omi, stood out to me. Omi is a freshman studying physics with a passion like no other. Her greatest inspiration is Neil DeGrasse Tyson, the American astrophysicist, author, and Director of the Hayden Planetarium in NYC. Omi aspires to follow his path and become an astrophysicist. Despite her hard work and incredible grades, Omi will be unable to pursue her planned career in Morocco. That’s because of the lack of resources and educational institutions with specialized programs, like those Tyson found at Columbia for his Masters and Doctorate in astrophysics. Her dream is to study in America and she described this goal as comparable to “winning a prize.” Her simple wish to continue her education in America with the same opportunities we have, points out some of the things we take for granted in the U.S..
Omi’s entry into the United States also is dependent on potential immigration policy decisions made by the new president elect. Such policies could greatly affect the ability of Omi and many other bright students to continue their studies in the U.S and realize their dreams. New innovations, technologies, and future solutions to current problems may also not be realized if many great international students are not given equal academic opportunities – especially if this means pursuing their graduate student dreams in America. Omi’s sincere desire to follow in the academic footsteps of her American role model was a real eye-opener. How lucky we are to live in the United States. 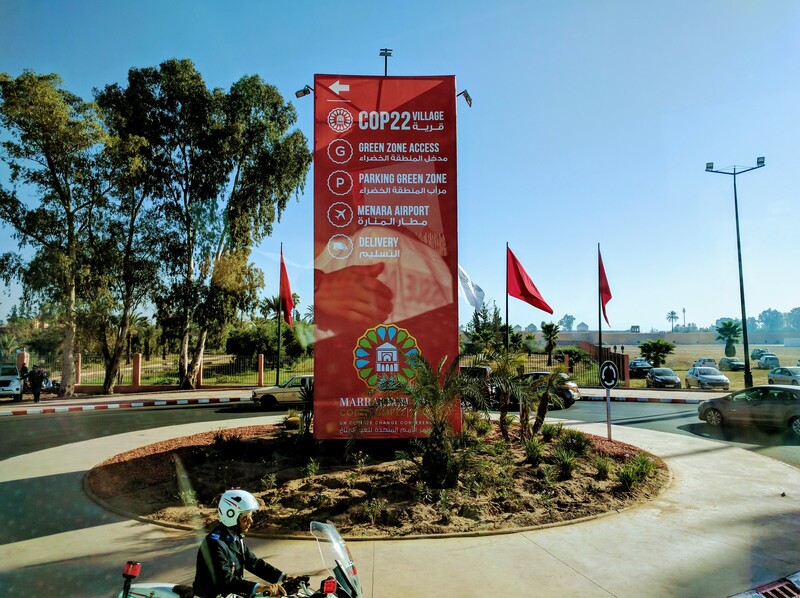 Upon entering COP22 on Monday I struggled with what to do next. What did any of this matter if the U.S. government refuses to help us? Fortunately, over the course of this week at the conference, I came to understand that I am far from alone in the pursuit of a healthier planet. Individuals, corporations, and governments from around the world are working harder than ever to solve the issues that lay ahead. And our young generation has a greater potential than ever to completely reshape our world for the better. On our first night at the conference, all of the UConn students entered a panel of faculty from around the world, discussing the role of Higher Education in future environmentalism. Professors spoke in French and English about how important it is that every college student learns about sustainability. As our generation is the one bearing the brunt of the climate crisis, it is vital that we are all equipped with the knowledge of how climate change and other environmental issues occur, how they relate to issues of social justice and economics, and how to create lasting solutions. It is important not only to teach sustainability, but also to make the lessons memorable; as with any subject, students are most likely to remember the lessons that are interesting, engaging, and relatable. Luckily, UConn students and faculty are pursuing this goal by promoting a new environmental literacy/sustainability general education requirement through a student-circulated petition and a faculty-led workgroup. It would be wonderful for our university to be on the short list of schools around the world that have adopted such a requirement. So how exactly can we, as students and faculty, construct these programs for more schools besides our own? Networking. Luckily, we had numerous opportunities to network and exchange ideas with a host of other people throughout the conference. On Monday night, several of us were stuck waiting for our bus back to the hotel. Luckily, a potentially troubling situation quickly turned into a great opportunity. As we waited, we began to exchange information with some of the other conference attendees. Mostafa, for example, is a journalist from Cairo. For the last few years, his work has granted him unique opportunities on the front lines of our changing world. Mostafa has seen the death and destruction caused by Syria’s civil war, and the plight of the now impoverished refugees trapped in Jordan and other countries. And of course, he was actively involved in the 2011 Arab Spring demonstrations that removed Hosni Mubarak from his decades-long rule. He also had to watch helplessly, first as the extremely conservative Mohammad Morsi was elected, then as Morsi was forcibly deposed by Abdel al-Sisi and his military companions. Now, Mostafa and his friends — who, like us, want a nation of more democracy and transparency — are stuck under military rule with no sign of an election in the foreseeable future. Interestingly, we observed how the Arab Spring, and other recent events like the Brexit vote in the United Kingdom, share similar social trends: the population at-large seems to be sick of ineffective “establishment” governments, but there is a strong divide as to what should replace the current world order. Before Mostafa boarded his bus, I asked him for advice about what we could do to counter our potentially regressive regime. He said: “Be patient. Unlike us, you’ll have a midterm election in two years, and another presidential election in four. Before then, we can all form a more connected international community.” We exchanged information, and will hopefully continue to build grassroots international support for climate awareness and action. As the week went on, our group continued to ask ourselves what many Americans have recently been asking: How has our nation, and even our world, become so polarized? On Wednesday, we brainstormed this question with students from other American Universities and the Moroccan University of Cadi Ayyad. We gathered in one of the large university’s boardrooms with local students, as well as students from American schools such as the University of Denver, Columbia University, University of St. Louis, and several from Historically Black Colleges and Universities cohort. After introductions, UConn professor Oksan Bayulgen observed: In our generation, there are some teens and young adults who, like us, are incredibly passionate and active about a wide range of issues. But there are also many who show nearly complete apathy towards anything controversial or political. I, and some of the other American students, suggested that many of us are stuck in online echo chambers — we follow people and ‘news’ sources that align with our pre-existing ideas, and fear or condemn those with different outlooks. People also suggested that many American millennials need to be reached in areas of their life that matter to them. Examples include eco-friendly fashion, green community service, and sustainable diets. Some of the Moroccan students expanded on this notion and suggested that environmentalism is also a subject that too often is presented as abstract. Students need to learn, from a very early age, that sustainability is a real-world issue that affects us all. I spoke later with Zakaria, a local student who runs “Science Caravans” with some of the other students who were at the networking event. They travel to local high schools and demonstrate simple experiments that explain how climate change works. 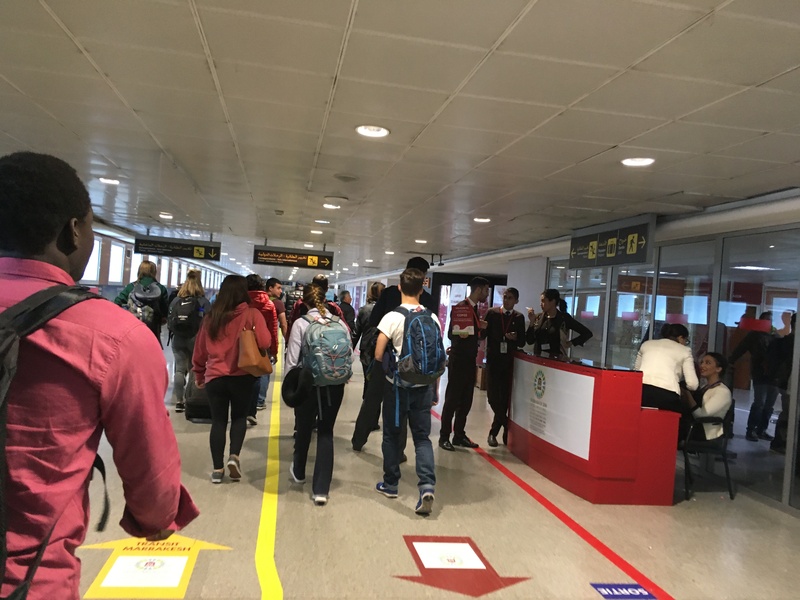 Other Moroccan students suggested more outreach with a stronger focus on human rights and social justice issues that accompany climate challenges. This promotes community service and engages poor and minority stakeholders in the battle to avert a climate crisis. Throughout the conference, we spotted many more opportunities to improve our generation’s global networking. For example, one of the many NGOs presenting in the Civil Societies pavilion held student gatherings throughout one of the days. While we weren’t able to attend ourselves, we gathered information about the organization, called Sustaining All Life. A U.S.-based group, they encourage exactly the information exchanges and conferences that we support. I’m happy to say that I feel much more positive about our generation after all of these networking encounters. This, coupled with a Northeastern U.S. college sustainability conference I attended two weeks ago, has shown me that our generation is very proactive, especially in the face of disaster. All it takes is a coordinated effort! 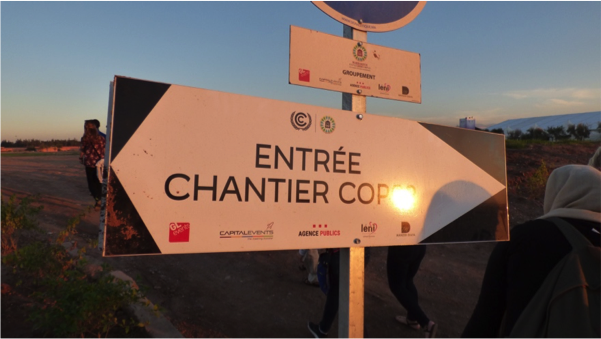 On Wednesday afternoon the group took a taxi ride to the Universite Cadi Ayyad for a program entitled, Colleges United for Climate Action; Connecting at COP22. As we walked through the university gates on the bustling city street, we entered a beautiful and sunny campus with walkways lined with orange trees and students hanging around the open-air academic buildings. Upon entering the main building, we were greeted with quintessential Moroccan architecture; elaborate wooden archways and red-clay walls, leading into beautiful lobby with delicate tiles that covered pillars that extended all the way to the ceiling. 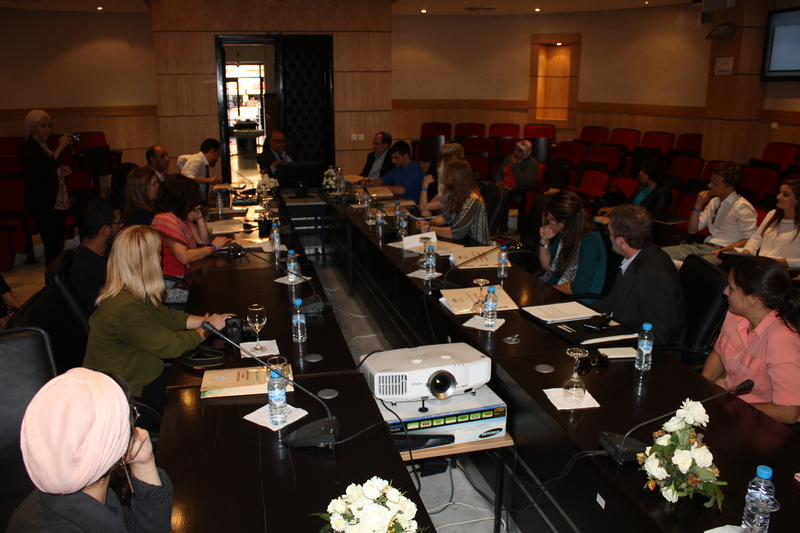 Various students and professors from both UConn and other universities in Morocco and beyond sat around a long conference table in the main building of the university. Soon after the introductions from the university president and the students and educators in the room, our very own Dr. Oksan Bayulgen posed the idea; how can we get students at UConn to actually care? This might seem mildly offending for some students reading this – no one wants to be called out for being apathetic. But let’s be real, a majority of us do not do all that we can in our community to combat the issues of climate change, nor do we feel overwhelmingly guilty about it. We don’t rally around the ideas of rising sea levels and depletion of bio-diversity like we rally around President Herbst not calling a snow day. The evidence is clear, climate change is a real and imminent threat to us all, and there are tangible steps we can take to reverse the effects. It was agreed upon that while most students know the threats of climate change, the day-to-day behavior of each individual needs to reflect this on a much larger scale. On the topic of integrating climate awareness on campuses and the role of a campus in spreading awareness, Dr. Beverley Wright, a professor of Sociology and the founding director of the Deep South Center for Environmental Justice, gave an answer that I found promising and feasible. Dr. Wright expressed an idea about community-based partnership where a community of interest would guide projects and research in partnership with a local university. I think this idea is simple, yet can lead to the behavioral change that enables climate action, as we discussed beforehand. Specialized programs that emphasize community-based partnerships allow members of a community to actively engage in research, political advocacy, and awareness. There are many communities around Storrs that could pose a mutually beneficial partnership with UConn to transition to a more sustainable lifestyle. As we expand UConn’s sustainability programs and climate science research, we could use our resources to catalyze and support communities that are transitioning to more sustainable practices. Additionally, this allows UConn students to take community involvement to a level that directly changes our world, and could bolster the excitement and urgency surrounding climate change. Since these blogs were written, President-elect Trump has moderated his position, and stated that he is “open-minded” about the Paris Agreement; however, Myron Ebell, a vocal climate change skeptic for many years, remains in charge of the President-elect’s EPA transition team. “Maybe it won’t be so bad,” a taxi driver said as he weaved through the tangle of motorbikes, pedestrians, donkey carts, and buses clogging the streets of Marrakech, Morocco. I flinched when he slammed on the brakes or accelerated through precarious gaps in the traffic. He was talking about U.S. President-elect Trump. He was trying to make me feel better even though the world was a very different place than it was just one year ago. Last December, the world met in Paris for the 21st meeting of climate delegates to the United Nations, or COP21 for short. The world agreed to try to limit global warming to 1.5 °C above preindustrial temperatures. The Paris Climate Agreement exceeded expectations. The world and the UConn delegation celebrated in the streets of Paris. Some of our faculty and staff cried tears of joy when they heard the news. Last year’s COP21 was one of shining optimism. This year’s COP22 in Marrakech was one of gritty determination. If the Paris COP was a flute of French champagne, the Marrakech COP was a can of warm Casablanca beer. Already the promises of just a year ago are fading. The world hasn’t figured out how to implement the lofty goals of the Paris accords. Whereas President Obama helped lead the fight against climate change, his successor threatens to withdraw. Against this backdrop, our second UConn delegation of undergraduates, faculty, and staff flew to the highlands of central Morocco. 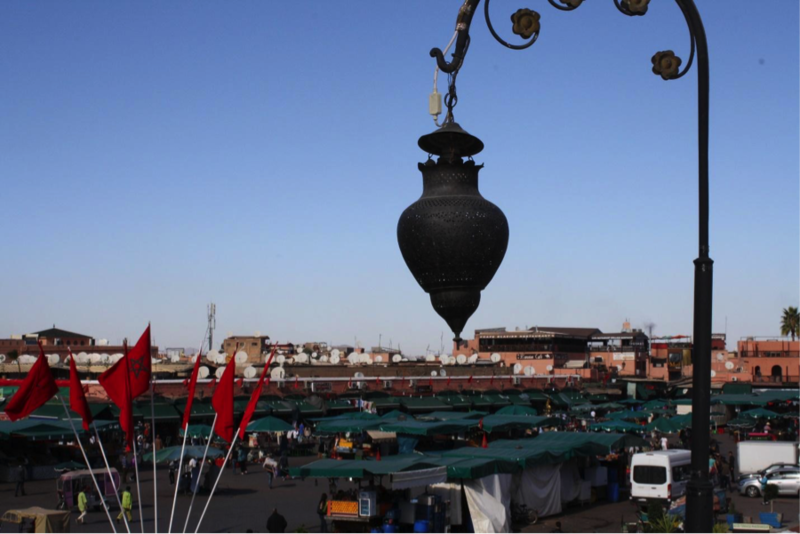 Marrakech, an ancient center for African trade, religion, and culture, provides the nexus for protecting all those things from a changing climate. Just beyond the ancient Jemaa el-Fnaa outdoor bazaar and outside the high pink walls of the Kasbah, the massive white tents of COP22 rose from a flat field. Out front, flagpoles of the world skewered the big African sky. 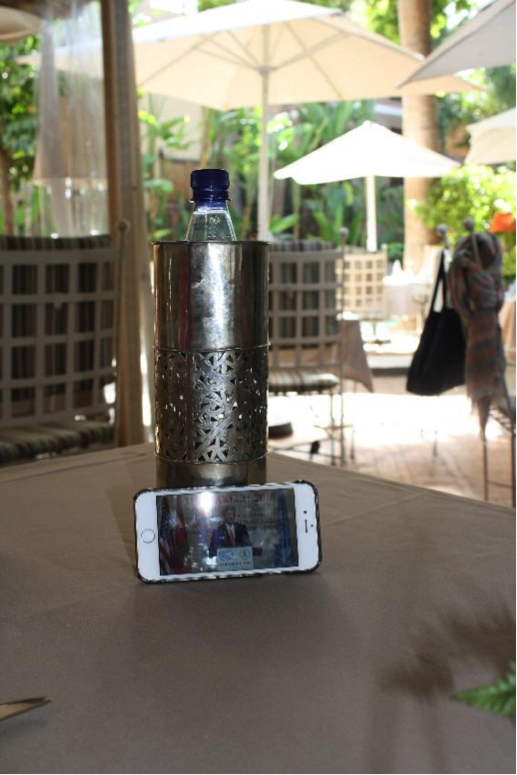 Like in Paris, we watched panel discussions about everything from the economy of climate adaptation to the sustainable development of Africa. We visited the government and corporate solutions tent, where new electric cars and photovoltaic cells shimmered under LED lights. We visited the stands of non-profit groups, cities, countries, and regions from around the world to hear about their climate solutions. The Nordic countries’ booth was expansive, white and clean. The African section was bright and welcoming. The Dutch offered a full bar, proudly extolling the ‘Dutch Approach.’ But I never found the US booth. Maybe the taxi driver was correct. Maybe it won’t be so bad. The world is united against the climate threat, even if our government is not. The world will lead, even if the US will not. As we flew into Morocco, my mind raced. Like many of my environmentally conscious peers in the United States and beyond, I was still in shock from the previous week’s presidential election. Among his many campaign promises, President-elect Trump has spoken of promoting policies that would be disastrous to the national and global environment. He has discussed reinvigorating the coal industry, which will translate into massive health hazards for the people of Appalachia. He has also proposed to dismantle the Environmental Protection Agency. This agency has improved countless lives by directly reducing the amount of pollutants in our nation’s rivers, air and soil. He has also suggested opening up our National Parks to private industries for exploitation. This would not only severely damage America’s tourism industry, but it would also destroy unique and irreplaceable ecosystems. And most dangerous of all, he is seriously considered abandoning the 2015 Paris Climate Agreement. Since the United States is Earth’s second largest greenhouse gas emitter (and may again become the largest as China seeks more renewable energy), this could mean that our country, which stands as a beacon for freedom around the world, may irreparably contribute to the largest global crisis in our generation. Needless to say, I was less than optimistic before we touched down in Africa. I felt something that others less privileged than myself have felt for years or even decades: a strong sense of disillusionment and betrayal towards the officials that are supposed to represent the interests of ALL Americans. The Trump Opener: A cultural phenomenon observed at COP22 in which, once the nationality of a U.S. citizen is established, the opening remark of the conversation is about President-Elect Donald Trump. “You know I’ve never met a Trump supporter,” Mostafa, a well-spoken, twenty something journalist from Cairo tells us as we wait for the bus from the Green Zone back to the hotel. We comment that people who voted for Trump don’t come to climate change conferences, or to developing countries for that matter. The statement is laced with condescension, the implicit message clear: they don’t know better because they haven’t seen the things we have, they don’t know the things we know. It’s how we explain their seemingly inexplicable choice. Rich Miller, from the UConn cohort comments that it’s interesting how close the rest of the world followed the U.S. election. Mostafa replies, “We’re all stakeholders – your elections affect us as much as they affect you, maybe even more.” And, to some degree, he is right. For better or worse, the U.S. is a global superpower. Our foreign policy brings not only humanitarian aid and other resources to developing nations, but also, all too often, our soldiers, our missiles, and our carbon emissions, which travel far beyond our borders. Mostafa explains that he sympathizes, comparing many Egyptians’ dislike for their President of the past two and-a-half years, Abdel Fattah el-Sisi, to many Americans’ dislike of Trump. “I was a part of the Arab Spring,” he tells us. With pride and eloquence he says that our generation is more connected than ever before: How incredible it is that we can know the story and thoughts of a 16 year old girl in Palestine, a 41 year old man in Iraq… or a 20 year old girl from Connecticut. There is a lull in the conversation. Ben Breslau, a fellow student from the UConn group, asks “So what do we do?” Mostafa emphatically replies, “You wait. Please wait. You do nothing. You have patience,” almost pleading for the new US administration to stand behind the Paris Agreement, reached just last year at the historic COP21. He cares what we do. He cares because it affects him too. It’s not just what the president does that has a global impact. It’s what we all do. It’s the votes we cast, the revolutions we start, the passion of our convictions, and the causes we choose to champion. A few minutes later we meet a delegate from Turkey, “You’re from America? I was here [at the conference] as the election results were coming in.” He says people cried and scheduled talks were abandoned to discuss instead the potential devastation Trump’s environmental policies could have on the world. I hope that no matter what Trump does, no matter how drastic or inflammatory, we, as a country, can be more than his actions. Let’s use the overwhelming feelings of frustration and helplessness to create a better United States. Let’s treat each other with more kindness. Let’s use the outrage and fear that surround Trump’s election to be a catalyst for change. Let’s join together to reduce our contribution to greenhouse gasses. If we can’t take pride in our President, let us instead create a culture, country and carbon footprint we can be proud of. I shuffled in and out of shops trying to find a souvenir in Marrakech when one merchant turned to me, chuckled and asked “you voted for Trump?” I was confused and slightly embarrassed that this election was following me deep into the Souks of the Medina, but I was not surprised. 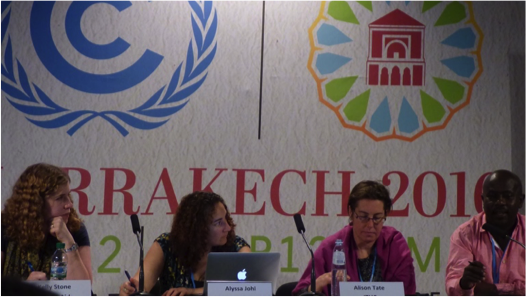 In fact, before that encounter, most panel discussions I attended at COP22 mentioned the election results back home, which named Donald Trump as our president-elect. Throughout the campaign, Trump argued that climate change is merely a hoax spurred by the Chinese and criticized the United States for spending money on environmental initiatives to minimize its effects. He had threatened to dismantle last year’s landmark Paris Agreement, and Trump and revoke the Obama Administration’s Clean Power Plan, which calls for a decrease in carbon emissions from power plants. 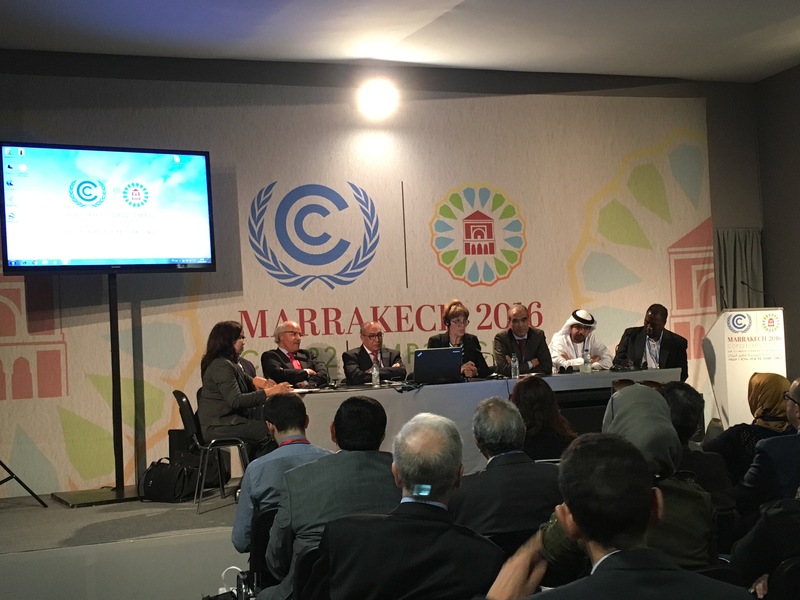 Of course, no one knows for sure what this election means for the United States and the rest of the world, but I heard opinions expressed by both sides in various panel discussions at COP22. Some said that the United States would not back out because of the geopolitical and trade implications, while others believe that the U.S. may step out of the game and perhaps force other countries to step up. Hopefully, enough people will speak out against Trump’s environmental policies. If our president will not fight on our behalf, we will have to.